One only needs to type the words “deer attack” into YouTube to see evidence that deer sometimes ‘lose patience’ with humans. In the majority of cases, this is just a short charge because the person with the video camera gets a little too close, or does something inappropriate. There are a number of cases, however, where the aggression is serious and the unfortunate victim ends up in hospital, or worse. Perhaps the most famous fatal encounter with a deer was that of King William II’s older brother Richard, the Duke of Bernay, who, at the age of about 27, was killed by a stag while on a hunting trip in the New Forest sometime around 1081. More recently, in September 2002, a hillwalker underwent surgery after being gored by a reindeer (Rangifer tarandus) in Scotland’s Cairngorm Mountains. Two years later, a deer farmer in North Yorkshire was killed by one of his rutting stags. Indeed, in his fascinating Kia: A Study of Red Deer, Ian Alcock wrote of his apprehension at keeping a stag, as they are highly aggressive and unpredictable during the rutting season. I have heard similar stories from people who have surprised (or should that be, been surprised by) stags while out walking. One keen fisherman from West Sussex, for example, described to a friend of mine how he had to climb on to the roof of his car during a confrontation with a deer in St Leonard’s Forest, near Horsham. Ultimately, the combination of offensive weapons in the form of antlers a flooding of the body with testosterone is a dangerous combination for bystanders. Situations are sometimes made worse by the unacceptable risks some people are willing to take to get a decent view of the rut. 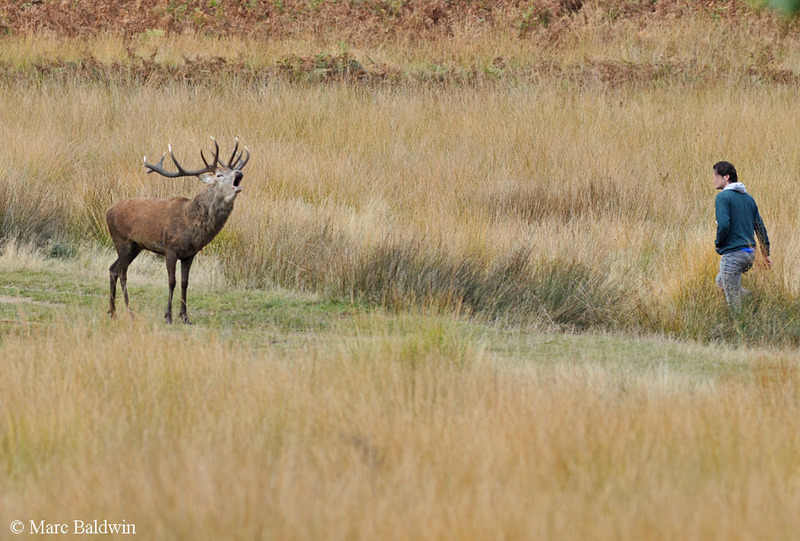 According to keepers in one area of the New Forest, the Red deer rut is becoming an increasingly dangerous time as photographers place themselves too close to the action – in some cases, between two challenging stags! In the case of the New Forest Red deer rut, the keepers have noticed a change in the deer’s behaviour and distribution. 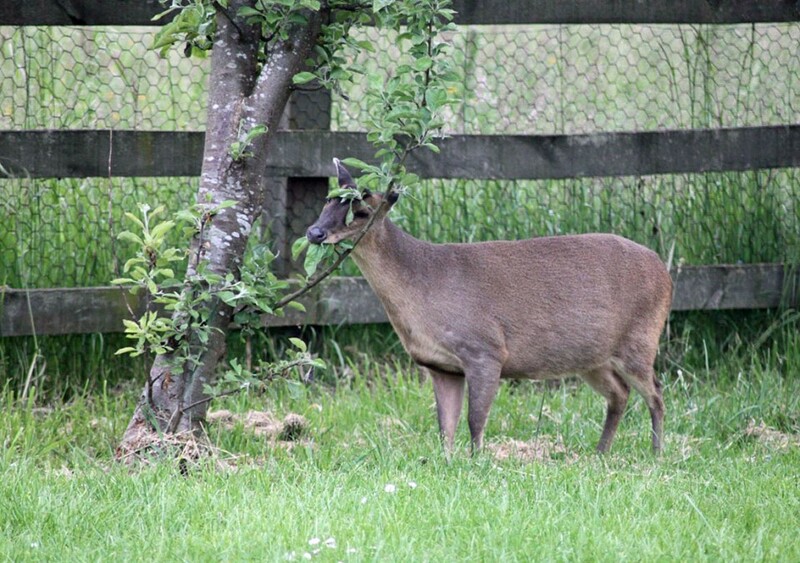 It seems that the rise in disturbance is causing deer to move out of the region, increasing their susceptibility to traffic collisions and causing them to move into sika (Cervus nippon) 'territory', where they are currently shot in a bid to prevent hybridization. It is not unknown for people, even those familiar with being in the company of deer, to get injured trying to get shots of rutting deer. In the bio section of his Sett on the Heath DVD, wildlife cameraman Rodney Goodhand tells how he was hospitalized after being charged by a Sika stag while filming at Arne in Dorset – the deer cut open his hand and injured his thigh. I have no doubt that Mr Goodhand was being sensible in his actions, so this just goes to show that even careful observers are not immune to the threat of injury. In terms of damage to property, deer are known to eat garden flowers and vegetables and may cause damage while doing this. Similarly, in the case of the unlucky fisherman referred to earlier, I am led to believe his car had a few scratches on it. Deer have also been implicated in attacks on dogs. In the majority of cases, injury has occurred when the dog chased the deer. Such cases tend to be most commonly associated with muntjac (Muntiacus reevesi), which seem to have a habit of abruptly stopping during the pursuit and crouching down with their head tucked under their chest (exposing their sharp, pointed antlers). A swift upward movement of the head can lead to the near-disembowelling of an over-enthusiastic dog. I have read some accounts to suggest that dogs have been killed in this manner before, although I have not read any first-hand accounts. I should point out that the chance of a dog being injured by a deer is slight, especially when under its owner’s control, and that deer (especially fawns/kids) are at far greater risk from dogs than vice versa.